When most of us were growing up mobile phones didn’t even exist, so it can feel quite strange when our kids feel the need to have a mobile phone by their side 24/7. While as parents ourselves we recognise that giving your child a smart phone can be a difficult decision. On one hand you want to be able to keep in touch with them and know that they are safe, while on the other hand you may have concerns about the type of content they could be watching. A UK study has found that just over 20% of parents do not monitor what their children are doing online. Well it seems that our household is not the only one with this problem as a recent study by Telstra in Australia has shown that Australian children are spending, on average, almost an entire day of the week on their smartphones. Research released by Telstra on Monday says that more than two thirds (68 per cent) of children aged three to 17 own a smartphone and an average of 21 hours and 48 minutes per week is spent on the devices. The online survey of 1365 parents concluded that their top concerns involved the time-sapping power of phones and risks around cyber safety and sexting. Dr Coulson also recommends a minimum age of 12 or 13 for children to be given a phone. “And then make it a dumb one. Smart parents give their kids dumb phones,” he said, advising that phones with only text and call capabilities were better options than smartphones. 12 is the average age of ownership. More than half (54 per cent) of those who own smartphones also own a tablet. 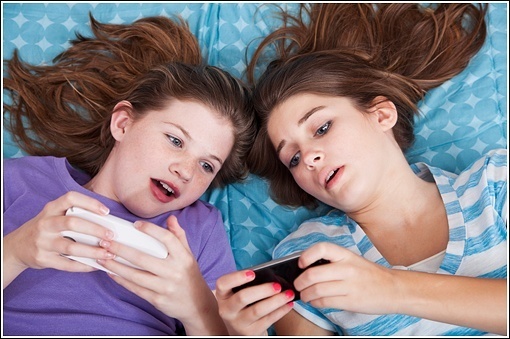 Facebook, instant messaging and Snapchat are the most distracting apps, according to parents.